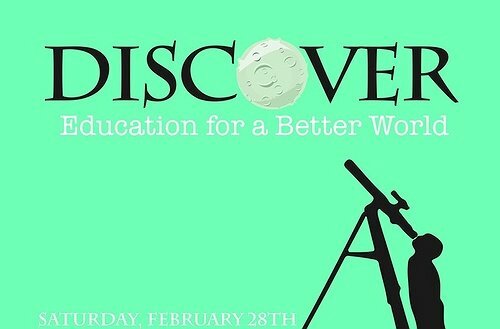 Peconic Community School Presents "Discover: Education for a Better World"
Peconic, NY - February 6th, 2015 - The Peconic Community School will present Discover: Education for a Better World on Saturday, February 28, 2015 from 12 noon to 10:30 pm. This day-long event will begin at Peconic Community School in Aquebogue and will include free interactive workshops, art activities and demos presented by area non-profits, as well as an expert speaker series presenting ideas to revolutionize education. This day time line-up will be followed by “The Party” at Greenport Harbor Brewing Company’s new tasting room in Peconic, featuring music by east end’s own Gene Casey and the Lone Sharks. From 12 noon to 3 pm local not-for-profits present workshops and demos during Peconic Community School’s open house. This free family event will feature East End organizations including Hallockville Museum Farm, Tom Barry of Green Revolution Woodworking, Cornell Cooperative Extenstion/Peconic Estuary Program, Children’s Museum of the East End, Ellen Nora’s Art Studio for Kids, East End Arts, and Hippy Hive HoneyBee Cooperative. Children can enjoy art projects and demonstrations, and adults can learn more about the Peconic Community School and area not-for-profits. Special door prize will be awarded to one luck attendee. From 3 to 5 pm at the Peconic Community School guests will learn about ideas to revolutionize education through expert speaker presentations. The fee for this portion of the event is $30 per ticket. Speakers to date include Ameer Mourad, learning designer from the Institute of Play, and Mimosa Jones Tunney, writer for television and film. Bios on these speakers are available at the end of this release. The event coordinators anticipate one more speaker to be added to the line-up. From 7:30 to 10:30 guests will enjoy the musical talents of East End’s own Gene Casey and the Lone Sharks during “The Party” at the Greenport Harbor Brewing Company in Peconic, NY. The fee for this portion of the event is $35, and includes one complimentary ale or lager and light finger food. Ameer is responsible for supporting teachers in developing game-like learning experiences. He was a founding faculty member at Quest to Learn, where he taught middle school science for three years before returning to pursue his Ph.D. in Educational Psychology at the CUNY Graduate Center. He brings his classroom experience, research training, and passion for innovative education to every meeting in order to support professional development for the next generation of Quest educators. Mimosa Jones Tunney started her career as the youngest gubernatorial speech writer under Governor Bob Miller of Nevada at just 21. A few years later, as the founder of the Entertainment Development Corporation and the CineVegas Film Festival, she was named Nevada Deal Maker of the Year for bringing in nearly $10 million in business to Las Vegas. In 2006, she began her writing career working with Oscar-winner Aaron Sorkin and went on to sell a half a dozen projects with Oprah Winfrey (HBO), Tom Hanks (Miramax) and Tony To (Starz). Jones Tunney is currently writing the life story of Maria Montessori. She is married to restauranteur John Tunney, III and mom to her two favorite people, John IV and Duke. The Peconic Community School (PCS) was founded in 2012 by a group of committed parents and professionals, fulfilling the longtime dream of sisters Elizabeth Casey Searl and Kathryn Casey Quigley. PCS is an alternative educational experience for children attending preschool through 6th grade that provides children with learning opportunities that are collaborative, arts-integrated, and community focused. The school’s mission is to foster reflective, resilient, compassionate learners in a safe, caring, trusting environment. Subject: LongIsland.com - Your Name sent you Article details of "Peconic Community School Presents "Discover: Education for a Better World""